On Wednesday night, all eyes were on Central Saint Martins' BA Fashion class of 2017 – with students presenting collections that tackled pressing social issues, ideas about gender and the UK's upcoming election. Design reporter Alice Morby picks the 15 graduates to watch. The university's graduate show took place at the Granary Square campus. Students from the four fashion pathways – womenswear, menswear, print and knitwear – all sent collections down the catwalk. In a year filled with political unrest and uncertain futures, the students appeared to channel their frustrations into their projects, presenting garments fuelled by statements and performances charged with uneasy energy. Estonian designer Johanna-Maria Parv based her collection on the restrictive nature of typical feminine attire, and the ways women have rebelled against it. Precise tailoring was gathered around metal components in between the thighs, and cycling accessories such as helmets and gloves were supersized. Yorkshire-born Matt Dyer always uses nostalgia as a starting point. He attributes his "obsession with uniform and workwear" to his time spent working in a factory, which translated into vacuum-packed shirts and plastic bags with CSM-themed branding in his final collection. Daniel Sansom's presentation was perhaps the most theatrical of the night and closed with a model being carried on a throne by naked men, while dressed in a look based on Camilla Parker-Bowles. Titled Tory Punk, the collection included pantsuits covered with bags of cocaine and was set to a soundtrack of Theresa May soundbites. 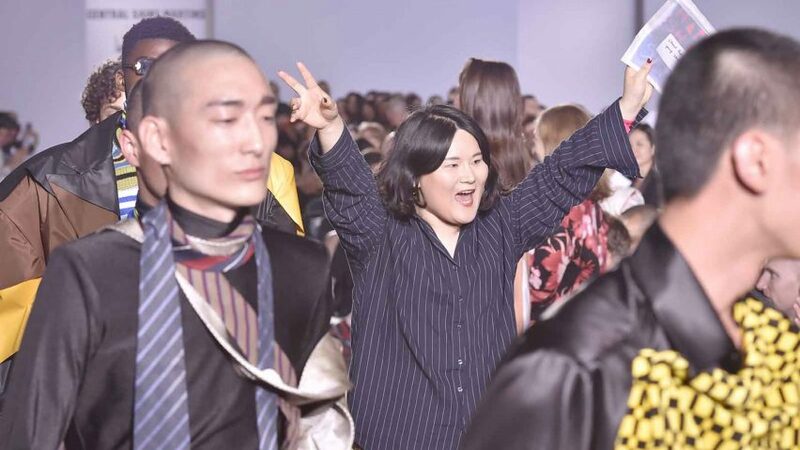 Goom Heo's collection appeared to fuse her South Korean heritage with her time spent in London. Traditional tailoring was combined with layers and layers of T-shirts, tracksuit bottoms and goggles. May Sutton describes her work as a "personal reflection on the boundaries of women's bodies", with her collection constructed from a combination of simple navy and white fabrics and bread. "The loaves of bread are their own life forms with strong bodily associations to women, made through the process of kneading, rising and baking," she told Dezeen. Joomi Ha's collection stemmed from questioning whether cultural originality, in terms of style, exists anymore. Having collected old clothes from second-hand shops, she styled them with her own clothes on a model who she then filmed moving around. The patterns and colours formed during movement were then reinterpreted as a two-dimensional flat knitwear pattern that we saw in the garments making up her final collection. Sheryn Akiki presented an incredibly politically fuelled collection, inspired by a journey she took down the border between Palestine and Lebanon. Drawing upon the feelings she experienced as a woman driving in that area, as well as the way the military use propaganda, she created a collection based on the psychology of army uniforms and "what you feel when you put it on rather than what you look like". Mowalola Ogunlesi's menswear collection was made up of skin-tight leather jackets and trousers that had been decorated with Lagos number plates, car logos and accessorised with bunches of lights. "It's all to do with the celebration of the black African male – his culture, sexuality and desires," Ogunlesi told Dezeen. "That's why the designs and the boys we cast in the show both encompass the colourful energy of Nigerian music." Kevin Germainer's collection was based on the transformation scenes of two anime characters named Lilian and Isabelle. Using entirely recycled materials, he created pieces that interpreted the personalities of each fictional girl, with knits made from of plastic bottles and upcycled beads from Hong Kong. Growing up in London, Tolu Coker began to question the way race and nationality can relate and inform a person's identity. Her collection, titled Replica, featured portraits she had collected, as well as those given to her by four people she documented in Paris and London – all with the aim of providing a commentary on the culture of stereotyping and appropriation. One of the most wearable collections from the show, Tae Kim's menswear pieces had an Yves Klein-inspired palette, with silhouettes inspired by military and workwear. He wanted to replace white as a basic, staple colour, and chose blue – a colour he describes as basic yet abstract – as the recurring shade. Korean designer Jae Yoo's very yellow collection was anchored on the Polish underground resistance in the 1930s and 40s. Yoo took inspiration from the slogan "dziś, jutro, pojutrze" – meaning today, tomorrow and the day after – and hoped to commemorate the people from this period through her designs. Chung In No used a simple colour palette made up of primary shades. Oversized jackets were patterned with digital prints, and models' faces were covered with sheets of stiffened mesh. Elena Koivunen's poetic collection was based on the relationship between her parents and how she experienced this as a child. The standout piece was an all-black suit, that was based on a passport photo the designer had coloured in. A prosthetic arm incorporated into the piece was holding a black bunch of flowers, and what appeared to be a printed photograph was actually a section of the garment. Xiaoming Shan's colourful collection adorned the body in graphic, coloured shapes – some of which hung away from the body while others stuck to the models' skin in the form of tape.